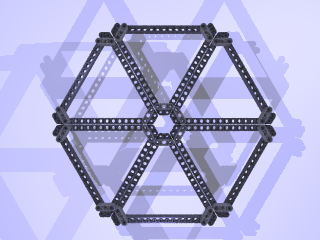 After the TECHNIC Meta-Parts, let me present another article from Kevin Knuth at BrickEngineer, which describes us some good examples and techniques to build triangular and hexagonal structures. His designs below, show equilateral triangles (equal side lengths). These are extremely sturdy constructs and the smallest possible ones are just below, together with the parts required to build them. Following we have similar but larger versions of the last triangle. They have however slightly different forms. 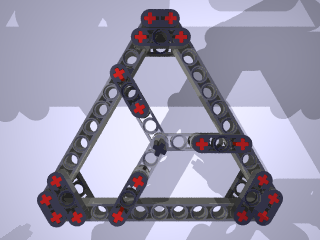 The left one uses 11L beams with 1L offset, so that there are peg holes at the triangle corners and the version at rigth uses 9L beams, but lacks holes at the triangle corners. 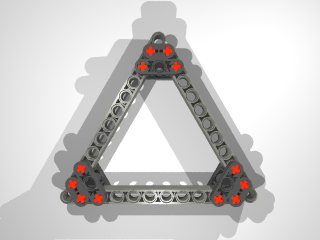 The example below, shows a 11L triangle with an axle at the center, made with a TECHNIC 3-blade rotor. 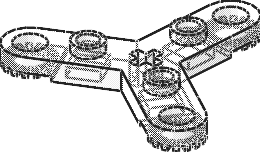 The animation illustrates how the braces hold the central rotor in place. Hexagonal platforms can be easily created with any one of the equilateral triangle designs above. Below an image for a large hexagon. The triangles in that hexagon are not connected, which can however be easily accomplished. Some type of plates per adjacent triangle sides would be just one example, strong enough for most applications. Triangular or hexagonal structures haven't been a "natural" form to build, with LEGO. 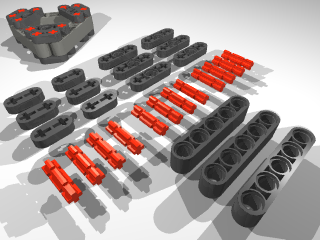 There are however a few TECHNIC parts, that would allow to develop in this way. Structural integrity apart, I don't usually find many uses for triangles in LEGO... with one exception. Killough platforms, which by themselves are an excellent topic for a future TBs article, are inherently triangular... actually, more like 3-point stars, but their basis is still a triangle. Up until now, all designs I've seen have been built using the traditional, "studded" method, with hinge bricks to make the angles. A Killough platform using the new "studless" method would certainly benefit greatly from the structures Kevin designed! Alex, at least for those made with the NXT, I believe all designs I've seen, were studless. Hmm. I find myself ending up with structural triangles all the time, to increase rigidity, cut corners in structures (literally, not figuratively), or provide inclined surfaces. 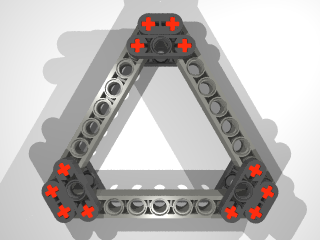 I rarely end up with equilateral triangles, but triangles in general I find commonly crop up... and for some things (DigiComp II), individual pieces like the tri-axle hub were absolutely critical (I've yet to find a better flip-flop gate). And yes, there are a number of Killough platforms (such as Steve Hassenplug's Omni) that are completely studless... and very strong to boot. that's some cool stuff up there. I added the triangle technique to my technique-collection.